Average rating of 12 reviews. We welcome Naturists of all nationalities who want to experience a relaxing holiday in a friendly environment. so if your looking for peace quite and great hosts Casa Amarela is a must for any naturist . I have just returned from Casa Amerela and would agree with every previous comments.As a first time naturist I couldn't have wished for a better place than this.If you want to chill out this is the venue. Breakfasts (served at 09:00) and facilities are outstanding . Jane and Stuart are perfect hosts. Already booked for next year. We zijn begin juni '14 een week te gast geweest in dit geweldige B&B van de zeer enthousiaste en toegewijde Jane en Stewart. Er is een mooie tuin met prachtige bomen, planten, bloemen en leuke zitjes, een mooi zwembad met voldoende ligstoelen en parasols In de villa zijn 3 sfeervol en met liefde ingerichte gastenkamers, met prima gedeeld sanitair. De overige 2 kamers, ook weer mooi ingericht en met eigen sanitair liggen tegenover de villa in een nieuwe bijgebouw, waarin ook een overdekt terras is. Iedere dag serveren Jane en Stewart op het terras van het huis een uitgebreid ontbijt met o.a. vers fruit, verse jus d'orange, eieren, toast etc. Ook kun je enige keren per week genieten van de gezamenlijke avondmaaltijd (paella, barbecue etc. ): Jane vraagt dan 's ochtends aan 't ontbijt vragen of wie er mee wil eten. Iedere dag worden de kamers opgeruimd en het sanitair heel goed schoongemaakt. De villa ligt in een rustig, natuurlijk gebied, z'n 10 min. rijden van oud-Albufeira. Een huurauto is handig, maar je kunt ook regelmatig met Stewart en Jane meerijden als ze boodschappen gaan doen. Of gebruik maken van een taxi. Samengevat: De vriendelijke en relaxte sfeer zorgt ervoor dat je een heerlijk ontspannen vakantie hebt. Zeker een bestemming om weer te boeken!!! It is April 2013. In the guestbook of Casa Amarela, I write our address and for a moment I have a hard time to remember what my own postal code is. This expresses how relaxed we are after being here for 9 days and nights. We adopted the same pace of life as the turtle at the swimming pool. We do not know what is happening, but it must have a relationship with the, or THE, casa. No, it is Jane and Stewart or Stewart and Jane. We thank them. We leave reborn to return to Holland. We stayed with Stewart and Jane for 10 days over the Easter weekend 2012. It was our first visit to Portugal and we will definately be back! We stayed in one of the en-suite rooms by the pool. This was small but perfectly formed, particularly if you are experiencing glorious weather. Whilst we didn't venture into the pool it looked lovely. There were plenty sun beds and parasols around the pool; as well as a roof terrace. We did utilise the hot tub.... daily; sometimes twice and thrice daily!! The sauna was ingenious and a great facility for late evening recreation. Breakfast was served between 8.30 and 9.30; with a selection of; cold meats; cheeses; fruits; yoghurts; cereals; toast; jams and preserves; and.....wonderful creamy scrambled eggs!!! Stewart and Jane were great hosts who made sure we had what we wanted. They organised a lovely trip to Pedro's for a real Portugese experience!! We would reccomend Casa Amarela. Casa Amarela is a wonderful destination. One that we have been to for the second year running and will be returning to again next year. The hosts, Stewart and Jane, couldn't do enough for us. The atmosphere is relaxed and peaceful and we are always made to feel welcome. The facilities are really very good - hot tub and bar area in beautiful surroundings (plus a sauna) - and the accommodation is kept immaculately. Jane's cooking is fabulous - an ex chef as we understand it. We can't recommend this beautiful oasis highly enough and will return as often as we can! Casa Amarela is a delightful, secluded retreat where we feel relaxed the moment we arrive. It’s peaceful, private and the house, bedrooms, beautiful gardens and facilities are really well cared for by fantastic hosts Jane and Stewart. We’re always welcomed warmly to somewhere we think of as our second ‘home’. A hearty breakfast, a day lounging in the sun, splashing in the pool, soaking in the hot tub and steaming in the sauna followed by one of Jane’s mouthwatering dinners, jovial atmosphere in the company of fellow guests and the contentment of feeling completely chilled out. What more could you want? 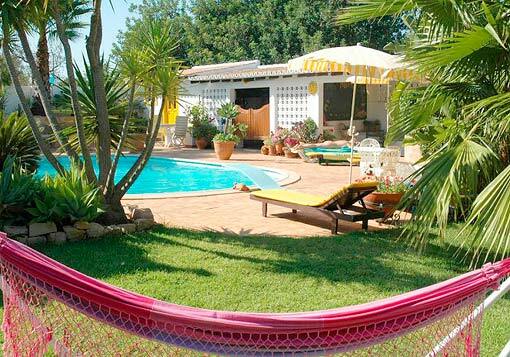 Casa Amarela is blissful to visit, a little piece of heaven in the Algarvean countryside. From the moment we said hello, we felt at ease. Stewart made us a warm welcome at the airport. Once arrived at Casa Amarela he said:”You must be hungry; we make something to eat”. And they did. Instantly we saw the fantastic facilities: pool. sauna, Jacuzzi, beautiful garden, nice room and bathroom. The extra’s: the easy atmosphere, the delicious meals that Jane cooks, the trips they organize, the bicycles available, the readiness to drop you in town. And when you don’t want to enjoy the meal together there is a kitchen for the guests with a refrigerator in which you have a shelf. Jane and Stewart thought of everything, it seems. They also organize trips for their guests. We went on a daytrip to Tavira town and island. The beach and the generous picnic lunch, the stroll in the town: a wonderful day. Furthermore: the market in Guia, the centre of Albufeira around the corner, the visit to the karaoke bar where we were impressed by Jane’s singer qualities. What could anyone wish for more! This little oasis has become our annual escape. Jane and Stewart have created a peaceful and relaxed atmosphere that allows us to feel "at home" away from home. The addition of the sauna and hot tub have made this an even more appealing destination, particularly when the weather isn't at its best. We look forward to our next visit before we even leave. If beautiful, relaxing surroundings and a chilled out atmosphere in the sun is what you are after - then this is a definite must. From the moment we arrived at this little paradise we felt at home. Stewart and Jane make you feel part of the family from the outset. The house, gardens, terrace and pool are beautiful. The Sauna and hot tub/bar area fantastic! If you want a relaxing holiday in gorgeous surroundings with wonderful hosts then this is the place for you. What is your experience with "Casa Amarela - Portugal Naturally"? How do you rate Casa Amarela - Portugal Naturally in general?